France was a dominant world power in part because it used to be the third most populous nation on earth (after China and India). Its population growth stagnated in the 19th and 20th centuries and it was overtaken by Germany, among others. Europe as a whole used to count for 20%+ of the world population, now they are barely 5%. Fears in 1989 were that Japan would overtake America economically. But the Japanese population growth stopped, and reversed, while Americas steamed ahead (we've added another 50 million people, IE, the entirety of England, while Japan has added essentially none). Or think of historical antagonists. In 1900 Britain had 40 million people to Iran's 7 million. Today, Britain has 60 million to Iran's 70. 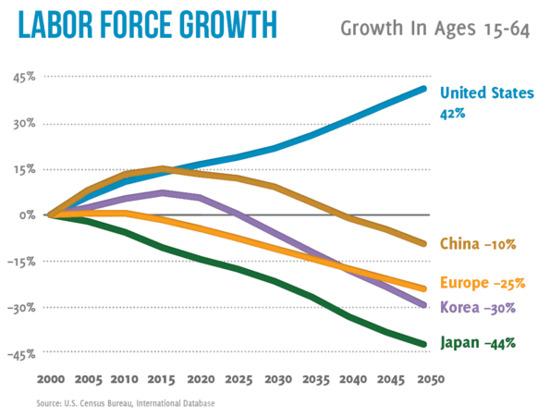 Anyone who thinks China is destined to overtake America has not learned the lessons of demography. We Americans right now are haggling over debts and austerity, but at the end of the day, we're going to add another 150 million people by the year 2050, which is almost a 50% increase. China is going to start shrinking in population. Their ratio of workers to retirees will dramatically worsen, while ours will stay about the same (hence the oft repeated phrase that "China will get old before it gets rich"). If it was up to me we would encourage this even more, instead of turning into a xenophobic cocoon. A huge advantage that we still have is that most people would rather immigrate to the United States instead of China. Why not open our doors to skilled or driven foreigners from around the world? Every immigrant is a taxpayer. Immigrants are hard workers. They start business, and since they often have big families, they buy houses. Every immigrant is another ambassador to their home country, increasing the soft power of America around the world. To an America with 500 million people, the debts of today are entirely manageable (assuming we can slow the growth of the debt to some extent). In contrast, the crushing burden of supporting retirees with the waning of the demographic dividend that China is now experiencing is a recipe for stagnation or worse. America will probably be the second largest economy in the world by mid century. Rather than China that overtakes us, my bet is that it will be India. By 2050 demographers are projecting population growth of another 400 million people on the subcontinent.